We all been there right? What’s the definition of a perfect relationship? There is none. Though we try to move on, we try to look pass those who have done us wrong but we can’t. The feeling is too real, the resentment, the anger, at times it can be overwhelming. At times we may feel the need to do something about this feeling. At times we feel as there is no choice but the obvious and that deed is the most devastating of them all. Truly powerful and full of tension comes the film from director John Pata (Dead Weight) Pity. Set inside of a car on a stormy night we find our main character dealing with the stresses of lost. Stresses that drive him to the brink. Pata does a mesmerizing job with this tale. Even though it is only about 6 minutes Pity is impactful, edgy, and provocative. While we weren’t the biggest fans of his feature length film Dead Weight it is painfully clear that John is a master of the narrative. To be able to tell so much with so little is a tremendous feat and it makes Pity a thrill ride to witness. We saw some amazing films at HorrorHound Weekend but one that we spoke of during our journey home was Pity. Few films can accomplish the fearless nature of Pity as we are watching one man’s raw emotions being displayed on screen. The overall look and feel of Pity is conclusive and grabs the attention from inception. While maybe not to the level of what the character is thinking of doing we have all been in this position at one time or another. Thanks to John Pata and Pity we are all now better for it. We can’t wait to see what’s next from Pata as he is clearing becoming a name to know in the horror industry! Pity is directed by John Pata and stars Jake Martin. It is based off of the short story “Prowler In The Yard” by J.R. Hayes. It will be showing at the upcoming Sixx Tape Short Film Spectacular March 29th (SOLD OUT) and is the opening film in the short series of Hollywood HorrorFest on March 28th. 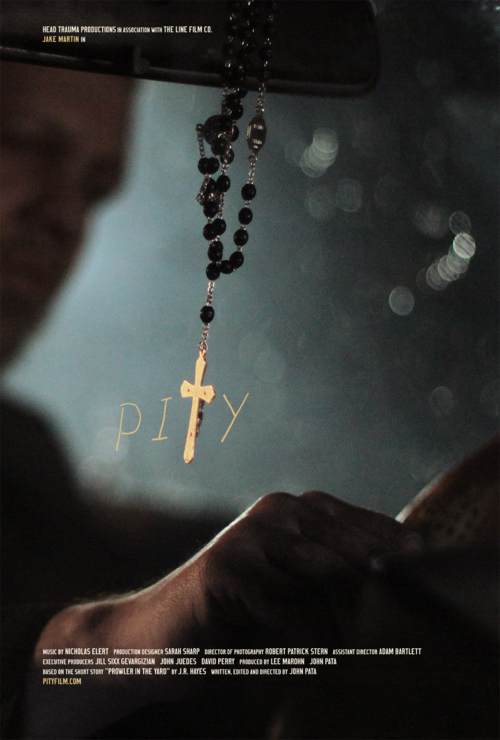 For more information on Pity visit their official website: http://www.pityfilm.com and their Facebook page.